Lock in a great price for Riad Vanilla Sma - rated 9.5 by recent guests. Most beautiful Riad serving as an oasis of rest right in the middle chaotic Marrakech. The staff is extremely friendly and will go the extra mile to make your stay as pleasant as possible. We got some wonderful tips for our stay. It is an elegant Riad with good facilities and an excellent hammam - it's position is ideal for wandering through the medina and staff are exceptionally helpful and informative. The Vanilla Riad team - they are great!! ; helpful and considerate. I'm sure we had such a memorable stay overall because of their support with tips on delicious restaurants, what to do and see, and arrangements of day trip and means of transportation. Everything, the team, food and location are perfect. It’s a beautiful Riad with the loveliest of people, so helpful and kind. You must stay here if you visit Marrakesh, simply perfect. We didn’t want to leave! The staff in the Riad is amazing and will go above and beyond to make sure you have an amazing stay. They made great suggestions for what to do/see, were always very helpful, and even surprised me on my birthday with a cake! The breakfast is delicious and the rooftop jacuzzi is a great way to relax even in the cool winter evenings. We are so grateful to Nelly and her team who went out of their way to help us have a most memorable, comfortable and enjoyable stay. As we were one group we loved that it felt like we were in a serviced house as we had the riad all to ourselves. Azziz and his team laid on a fabulous dinner for us on the first night despite it being so last minute as rain forced us to change our dinner plans in the last moment. I also loved the decor and interior design if the riad. The location is very central to the main square, Jemaa el-Fnaa, and one can easily walk anywhere throughout the Medina. When we needed to go further afield Redwan (apologies if i spelt it incorrectly) or Azziz would order a tuk tuk or a taxi for us which could be met at a short distance from the Riad. It was a quiet and calm haven in the organised chaos that is the Medina. And what an experience that was! What a lovely Riad! Nelly and her staff was so freindly and welcoming, as it was our first time staying in Marrakech we was unsure what to expect but as soon as we walked through the door we felt like it was our home. 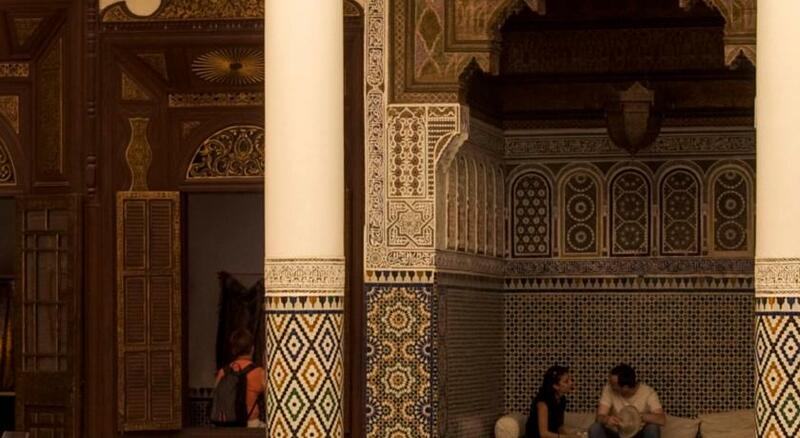 We ate at the Riad most nights as the food was exceptional and great value for money. The Riad looked even better then we imagined, I would highly recommend this Riad to anyone thinking of staying in Marrakech. Thank you. We had a wonderful stay here. The location was perfect. Close to all the action but a quiet and serene place to relax. In the mornings we were able to take it easy and have a lovely breakfast on the roof terrace. We had a massage that was wonderful. The staff was so helpful, kind and sweet. It was my birthday and the team made it special, it really moved me. Our stay here was a perfect combination, action outside but calmness and relaxation inside the riad with great service. We definitely go back. 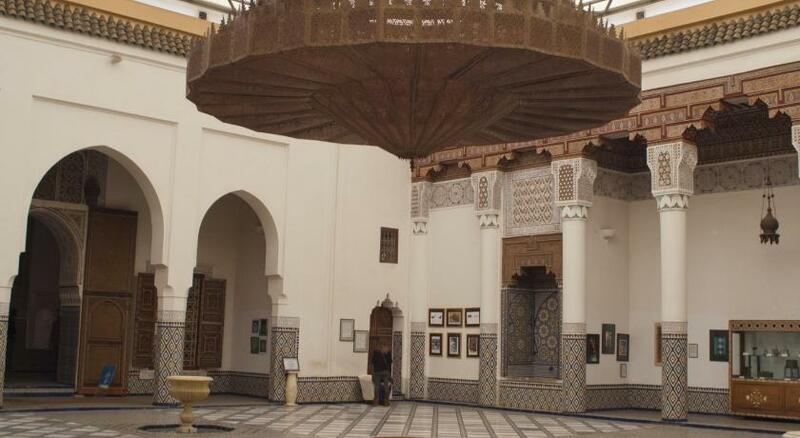 Wonderful Riad with gorgeous rooms in a perfect Location near the main market square. The staff was extremely friendly and helpful. We received a room upgrade free of charge and it was possible to have a late check out. The atmosphere in the Riad and the view from the terrace is outstanding. We would highly recommend this place. One of our top picks in Marrakech – and a guest favourite. Featuring a terrace with a hot tub and views of the Medina and Koutoubia Mosque, this guest house is set a 5-minute walk from Jemaâ El Fna Square. It offers a plunge pool, a patio with a fountain and several lounge areas. The air-conditioned guest rooms and suites at Riad Vanilla Sma are elegantly decorated and have view of the patio. They each include an en suite bathroom with a hairdryer. Traditional Moroccan cuisine can be served by the fireplace in the dining room upon request. Breakfast is served daily and massage treatments can be arranged on site. Car rental, babysitting and visits of the Medina can also be arranged upon demand. The property is 2.5 miles from the Majorelle Gardens and a 12-minute drive from Marrakech - Menara Airport. Airport shuttle can be arranged upon request. This property is also rated for the best value in Marrakech! Guests are getting more for their money when compared to other properties in this city. Riad Vanilla Sma has been welcoming Booking.com guests since 5 Oct 2012. When would you like to stay at Riad Vanilla Sma? The air-conditioned rooms feature an elegant décor, a view on the patio and a seating area. The air-conditioned suites feature an elegant décor, a view on the patio and a seating area. House rules Riad Vanilla Sma takes special requests - add in the next step! Riad Vanilla Sma accepts these cards and reserves the right to temporarily hold an amount prior to arrival. Guests must be quiet between 22:00 and 08:00. For a stay of minimum 4 nights the property offers a free transfer from Menara Marrakech Airport to Riad Vanilla Sma. Riad Vanilla Sma is at the end of an unassuming street(as most are) in the Medina. From the outside you'd never guess the experience waiting behind that door. You are immediatley treated like a member of their family. Nelly, Sultana, and Aziz were always buzzing around, friendly and super attentive. Stayed in the Sma Suite with my fiance..incredibly romantic! I'd give them 11 if I could. Breakfast was fantastic, felt very home-y. Riad Vanilla Sma was the best! So pretty, convenient and our hostess and Azidze were so helpful in every way! My sister and I loved staying at Riad Vanilla Sma. Raduoan was so helpful and gave us great tips for getting around the Médina. Aziz and the ladies there took great care of us! It’s peaceful (even in the heart of the Médina), safe, and very close to a main road, Jemma El Fna and the souks. The breakfast was absolutely delicious! I have only great things to say about this Riad! The staff is by far the best part of the experience. Raduoan, Aziz, the ladies of the Riad and of course Nelly is what makes this place so special. They work out your airport transfer seamlessly and upon arrival you are met with a welcome tea & full introduction to getting around Marrakesh. I want to add that any fears or reservations you may have about traveling through Morocco are eased the second you arrive at the Riad. The Medina can be quite intimidating for two girls but Raduoan and Nelly were so amazing at informing us and making us feel at home. They can book and help you with anything you need or want. Raduoan was able to book us a touk touk right from the doorstep to all of the main attractions around the city! The Riad itself is unbelievably clean and gorgeous. There is a rooftop Jacuzzi for relaxing after long days shopping and touring. The Hammam & Massage experience was exceptional and one of the best massages Ive had, its a MUST DO! Then we can talk about the food. We ate out a lot but enjoyed many meals in the Riad where they prepare a beautifully coursed dinner service of homemade Moroccan Cuisine and seemed to be the most authentic and best food we ate! The breakfast is also so delicious and every meal they give so much food you almost cant finish it! The location is also the best location I think in the Medina. Its about a two minute walk from the Souk and main Square. The rooms are also cozy, warm, quiet, clean and just beautiful. The bed is also very comfy. This Riad is a must stay and I would go back a million times over when I go back to Marrakesh, you will leave feeling like you made some great friends and found a home away from home! I truly recommend this Riad to anyone visiting Marrakesh. Thank you Riad Vanilla Sma for such a great trip! The stay was too short! Nelly and her crew were fantastic. They attended to my partner's and my every wish. The riad is so close to the market and square. Only a couple of hundred meters and you are in the market. Dinner at the riad was superb and drinks in the jacuzzi on the terrace was just beautiful . Even the WiFi connection was the best we had in Marrakech We were so surprised by the quality of our stay at Riad Vanilla sma that we would not hesitate to stay with them again or recommend them to anyone. Thank you Nelly,Redouan and the rest of the crew. It’s fair to flag that there is no bathroom door separating it from the sleeping area. Some rooms have a curtain; ours didn’t. It didn’t pose a problem for us. But since I hadn’t encountered that before, I was surprised it didn’t come up. Best thing about this riad is the owner and staff!! Can’t say this enough!! Nelly is such a gracious host! From the moment I booked via booking.com she communicated immediately and was extremely responsive to all my questions leading up to arrival. From arrival we felt so taken care of! Nelly sat us down and gave us a wealth of practical tips from where to eat (and where not), to how to handle yourself in the Medina, to what we should pay for taxis to various destinations. Trust me, these tips make for a much better experience in Marrakesh, which (in the medina) can be gloriously high energy, intense and a lot for the senses (that said, we love Marrakesh!). Nelly’s tips went beyond Marrakesh to helping us get our bus tickets for Essaouira (she arranged a driver to buy them at the station the day before our trip to save us the trek over there- you pay for this service if you want it) and gave us a wonderful restaurant recommendation in Essaouira and even made a reservation for us. The staff are also all extremely warm from those who cleaned the rooms to the darling gentleman serving us breakfast and tea on evenings. Special mention to Rédouane, who helped us with the details of arranging tuk Tuks, bus tickets, resto reservations along with Nelly and gave us tips on souks, what prices are reasonable for the items we planned to buy and more! He really is so lovely and we remember him fondly. The breakfast is also a treat! :) The riad itself has a clean, modern look but with a Moroccan flair. Less ornate and more simple spa chic. If you choose this riad, you will not regret it! While there chatting with the other guests, we kept comparing notes on how much we loved Nelly, the staff and our riad!